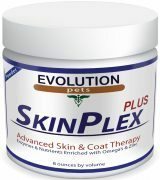 To provide topical relief of dry skin, itching, and scratching. 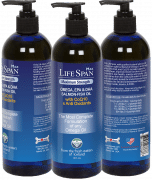 Provides moisturizing and healing agents directly to skin and coat. Categories: Dandruff & Eczema, Dry Itchy Skin. Available in 2 ounce size. Massage directly to skin twice a day until condition improves. Then apply 3x weekly to maintain healthy skin. Cover skin with tee-shirt if needed to ensure cream stays on skin. For topical use only. 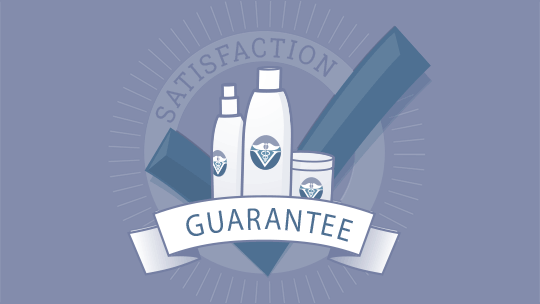 Always discontinue any product immediately if condition worsens. Aloe Vera: Moisturizes, soothes sores, burns and skin irritations. Aloe is also anti-bacterial and anti-fungal. Also excellent at treating hot spots and edema. Vitamin B3(Niacinamide): vitamin B3 is an important vitamin for skin rejuvenation. Effective at treating acne, fading hyperpigmentation, and improving skin barrier functions. Jojoba Oil (Simmondsia Chinensis): Since jojoba oil closely resembles a dogs skin lubraciting medium (called the sebum), it is a natural affinity to the skin and is easily absorbed for maximum moisturizing and healing results. It also softens the skin and hair, as well as removing rashes, scars, and damaged skin. Panthenol Extract (vitamin B5 extract): provides a catalyst for moisturizing the skin. Also very effective against acne and rashes. It is grate at keeping moisture underneath the surface of the skin. Thyme Vulgaris Extract: a great antioxidant, while providing great astringent properties. It is also a powerful antifungal and antiviral agent – helping to to boost the skins immune system. Sage Extract – excellent at eliminating rashes and acne. Also provides pain relief and is anti-inflammatory. Calendual: helps to create new blood vessels in the skin., and is loaded with carotenoid pigments and lutein, the antioxidant effects of which fight free-radical damage. Lastly, calendula stimulates collagen synthesis and cell regeneration. Behentrimonium Methosulfate Skin Conditioner: -Also known as “emulsifying conditioner”, this gentle ingredient is the key to exceptional skin conditioning. It is derived from natural Colza oil. and provides many functions. Camellia Sinensis (Green Tea): helps prevent free radical damage of the skin and possible skin tumors and cancers. Great healing properties and is a potent anti-inflammatory agent thereby reducing inflammation in the skin. Most importantly it has inhibitory action on collagenase, which is a collagen-reducing enzyme that breaks down collagen and causes a depleted skin immune system. Cetyl Alcohol: is a very effective and gentle skin softener (emoillient), especially severe skin problems. Kosher Vegetable Glycerin: skin softening and lubricating agent which provides soothing relief from sores, dry skin, hot spots, and infections. The lubricating properties make it a very effective protector of damaged skin, while moisturizing dry itchy areas. Echinacea: provides great healing propertiesd to damaged skin. Also controls inflammation. Among natural herbalists, Echinacea has been tried in the treatment of skin sores, inflammation, abscesses, eczema and canker sores. Zinc PCA: prevents and heals skin issues such as hot spots, excessive itchy skin, acne, rashes, and sores. Zinc PCA is perhaps the best natural sebum secretion ingredient available. 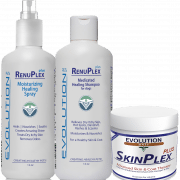 It acts to stop excess oil production both in the hair follicle and outer skin layer to suppress sebum secretion which can lead to canine hot spots. Emu Oil: Emu oil is a natural substance that relieves pain without the harsh side-effects of prescription drugs. It heals hot spots on dogs, wounds and burns, and reduces the pain and swelling of itchy dry skin. Also reduces insect bite swelling. Organic Black Willow Bark: great treatment against pimples. Is analgesic, antiseptic, astringent and anti-inflammatory. Organic salicylic acid, derived from black willowbark dissolves the hardened oil at the surface of the skin, allowing essential oils to penetrate the pore and ease inflammation. Licorice Root extract: natural acne and hot spot fighter. Licorice root extract possesses natural anti-inflammatory agents that can soothe skin affected by blemishes. If also assists in limiting the production of irritants in the body that contribute to the formation of acne, and fungal sores. Primula Veris Extract: anti-allergic, anti-inflammatory, and anti-bacterial, and very effective against open hot spots on dogs. Ascophyllum Nodosum Extract: Stimulates cellular growth and rejuvenates skin cells directly at the molecular level. Is also Anti aging. Alpha Arbutin Sodium Hyaluronate: repairs natural texture and removes rashes. Malva Sylvestris, (Mallow) Extract: extracted from Mallow Blossoms, it is healing, soothing, softening to the skin. It also reduces inflammation. Alchemilla Vulgaris Extract: has anti-microbial properties. Soothes the skin and acts as an astringent. It is helpful in wound healing and helps to strengthen the connective tissue in animals. Veronica Officinalis Extract: extracted from Speedwell plant, it has astringent properties, soothes irritated skin and reduces redness. Vitamin C Ester: promotes collagen production and fends against free radical damage caused by sun, stress, and the harsh environment. Tea Tree Oil: tea treeoOil has wonderful properties that makes it a popular natural agent for curing all three types of infectious organisms: fungus, bacteria, and virus associated with dog hot spots. More importantly, it is known to effectively fight a number of infections that are resistant to some antibiotics. Therefore, Tea Tree Oil is an excellent natural remedy for hundreds of bacterial and fungal skin ailments such as acne, abscess, oily skin, blisters, sun burns, athlete’s foot, warts, herpes, insect bites, rashes, dandruff and other minor wounds and irritations. Achillea Millefolium Extract: an extract from a flowering plant that helps soothe irritated skin. It is also known for its antibiotic, anti-inflammatory, antiseptic and healing properties. Yellow Dock: is an excellent all natural ingredient for skin clearing of oily skin. Tocopherol: shields skin cells from tissue damage and is ideal as an antioxidant for a dogs. A natural preservative. Ascorbyl Palmitate: an effective treatment for acne, dog’s hot spots, and rashes. Germall Plus: a natural preservative.